Welcome to the Martin County Historical Society! Our Mission is to preserve and share the history of Martin County by acquiring, conserving, appropriately displaying, and making it accessible for viewing, research, and educational purposes. We hope you enjoy the many features of our site; please contact us if you have any questions or requests. Thank you for taking the time to enjoy Martin County’s History! Things keep trucking along for the MCHS - we are working feverishly on renovating our former shop room in the basement - turning it into new display areas and partial storage room which will greatly enhance the room's use and benefit the museum! 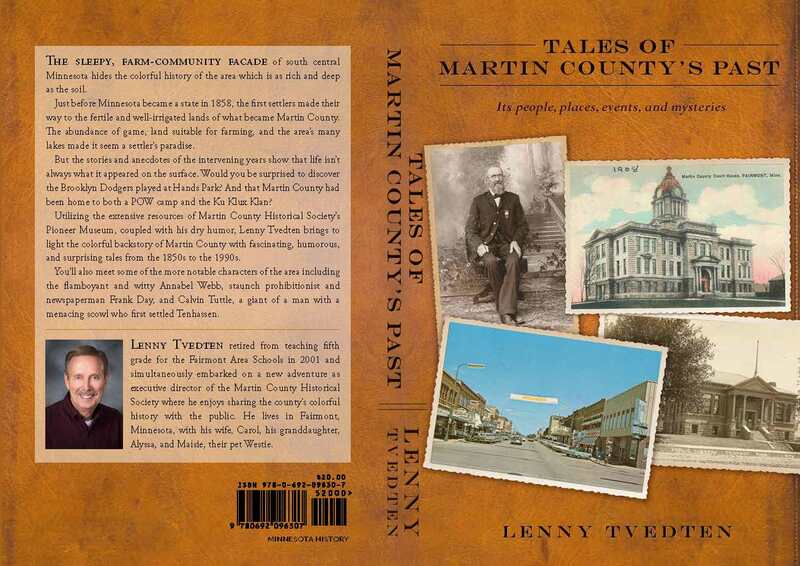 For sale, if you haven't already seen, is our newest publication - Tales of Martin County by our own Lenny Tvedten. The book costs $20 in house (more if we mail them). If you haven't seen our promotional video, check it out below! Again, thanks to everyone who supports the Martin County Historical Society through donations, visits, memberships, kind words, and so much more! Copyright ©Martin County Historical Society. All rights reserved.